The number of lung transplantations performed worldwide continues to increase. There is a growing need in these patients for more effective immunosuppressive medications with less toxicity. This review article summarizes the recent studies and developments in lung transplant immunosuppression. Novel immunosuppressive medications and strategies used in other solid organ transplantations are being trialed in lung transplantation. This includes the use of co-stimulation blockers like belatacept and mTOR inhibitors like everolimus. Calcineurin-sparing regimens have been described in an attempt to minimize nephrotoxicity. Assays to measure the bioactivity of immunosuppressive medications to determine the global immune competence, such as Immuknow assay and Gamma interferon response are gaining traction. Immunosuppression in lung transplant is evolving with the development of newer drugs and promising strategies to optimize immunosuppression. Further studies with multicenter randomized trials are required to increase the strength of the evidence. CCK is supported by the Robert D. and Patricia E. Kern Center for the Science of Health Care Delivery, Mayo Clinic, Rochester, MN and the NHLBI grant K23 HL128859 from the National Institutes of Health. The manuscript’s contents are solely the responsibility of the authors and do not necessarily represent the official view of NIH. •• Mian M, Natori Y, Ferreira V, Selzner N, Husain S, Singer L, et al. Evaluation of a novel global immunity assay to predict infection in organ transplant recipients. Clin Infect Dis. 2017; https://doi.org/10.1093/cid/cix1008. This article describes a novel assay of plasma gamma interferon in immunosuppressed lung transplant recipients. A low level of gamma interfoeron was very predicitve of infection. Banga A, Mohanka M, Mullins J, Bollineni S, Kaza V, Torres F, et al. 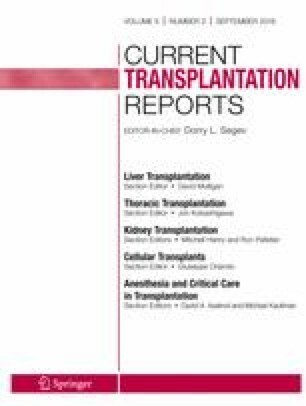 Association of pretransplant kidney function with outcomes after lung transplantation. Clin Transpl. 2017;31(5) https://doi.org/10.1111/ctr.12932.